As part of our ongoing collaborations with inSpiral, we have come together to bring you this wonderful recipe so you can recreate their award nominated desserts in the comfort of your own home. Enjoy! This was a favorite at inSpiral Lounge, but we had to pull it off the menu due to a fantastically short shelf life. However it’s perfect for the home connoisseur. Best eaten fresh. Combine all the ingredients in a blender and process until smooth. 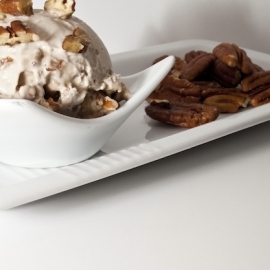 Pour into your ice cream maker and follow the manufacturer’s instructions. This will take approx 20-30 mins. Alternatively, blend and then pour into an 800ml dish and freeze for 2-3 hours or until ready, removing and stirring occasionally to avoid large ice crystals forming. 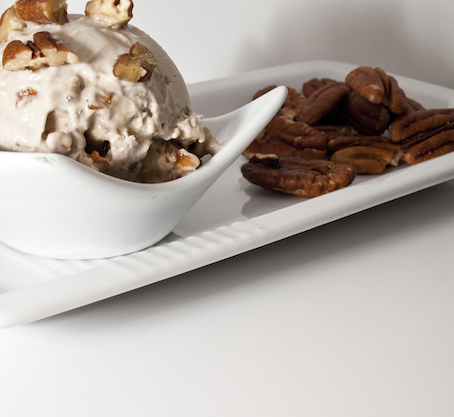 Serve in a small bowl and drizzle with maple syrup, decorating with pecan nut pieces.